ZERO net carb sweetener with erythritol, stevia and luo han guo. All natural! This is a 1 tablespoon sample of our all natural low carb white sugar sweetener with erythritol. Erythritol occurs naturally in some fruit and fermented foods. 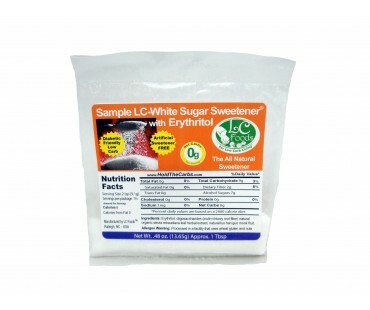 Erythritol is 60–70% as sweet as sucrose (table sugar), so at LC-Foods we blend erythritol with natural stevia and natural luo han guo to bring the sweetener level up to the same as table sugar without causing bitterness or a poor quality taste. The USDA has determined that erythritol does not affect blood sugar, so our product is diabetic friendly and less likely to cause gastric side effects. You can substitute our low carb sugar 1 for 1 for regular sugar in your favorite recipes and beverages*. Enjoy sweetening how nature intended, pure and natural. Experience your baked goods with the sweetness of sugar the healthy way! Completely all natural using no cane sugar, no corn sugar or syrup and no beet sugar! There is no bitter aftertaste, no alcohol sugars and it is artificial sweetener free. This is the best sweetener you will find on the market, with no bitter aftertaste, guaranteed! Our sweetener has a healthy does of dietary fiber. On the back of the package, you will find useful tips along with recipes for making an all natural, low carb sweet sauce and all natural simple syrup.